A man from Falls Church, Virginia, climbed Trump Tower in New York using suction cups on Wednesday because he wanted a private meeting with the Republican presidential candidate, officials said. Stephen Rogata, 19, was arrested Wednesday evening after police officers yanked him into a window. He was charged with reckless endangerment and criminal trespass, the New York Police Department said Thursday morning. Rogata began climbing Trump Tower, where the billionaire businessman lives and works, about 3:30 p.m. from an outside atrium attached to the building on East 56th Street, NYPD officials said at a news briefing Wednesday evening. 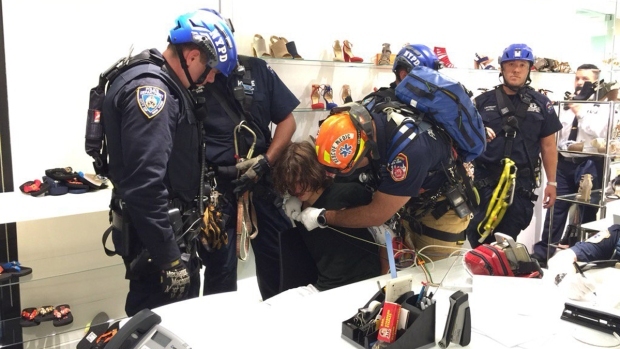 Hundreds of onlookers watched from the street with bated breath as he used climbing ropes and several construction-grade suction cups to make his way up the side of the 58-floor building, evading officers the whole way. Police, meanwhile, cut out metal grates, lowered window-washing rigs and busted glass windows as they slowly closed in on Rogata from different directions. Police spoke to Rogata as he climbed and tried to coax him in, and informed him at one point that the suction cups could cause the glass to crack. Rogata ignored officers and continued to climb. Finally, police pulled out an entire window at the 21st floor, creating a single-pane bottleneck for Rogata. He tried to climb past authorities, but two cops grabbed him and yanked him inside. Down below, the quiet crowd burst into thunderous cheers as the man was pulled to safety. One of the emergency services unit officers who made the grab told reporters they could tell he was getting tired. "I lowered a safety line to him and explained to him he should lock himself in, God forbid something happens. He was climbing for awhile, I could see he was getting tired," said ESU Officer Christopher William. "'If you lock this in, we will tie it, we will have you.' He refused to take the line." When William saw the chance to grab the climber safely, he took it. He said Rogata didn't resist after he was hauled in. NYPD Chief of Detectives William Aubry said Rogata is a researcher who arrived in New York City Tuesday intent on meeting with Trump. He had no intention of hurting anyone, he told police. Law enforcement sources said he drove up in his parents' car and was staying at the Bowery Grand Hotel. Relatives told police he was being evaluated for some possible mental disability. "I just want to climb. I just want to talk to Trump," he kept telling officers as he scaled the skyscraper, according to police officials. Rogata had suction cups and climbing equipment in his backpack and several IDs, along with some Gatorade, according to officials. It wasn't immediately clear if he had an attorney. Police officials said Rogata posted a video to YouTube on Tuesday indicating why he was climbing Trump Tower. A law enforcement source said he dropped a flier while he was climbing, and it referenced his YouTube video, which was posted under the name Leven Thumps, a character in a series of children's fantasy novels by the writer Obert Skye. "I am an independent researcher seeking a private audience with you to discuss an important matter. I guarantee that it's in your interest to honor this request," he said. "Believe me, if my purpose was not significant, I would not risk my life pursuing it. The reason I climbed your tower is to get your attention. If I had sought this via conventional means, I would be much less likely to have success because you are a busy man with many responsibilities." There were several tense moments during the climb where the man appeared to stop and motion toward cops who were trying to coax him inside. At one point, he reached inside his book bag to get a white baseball cap and a swig of water. A piece of glass taken out by police also nearly fell on him. Officers threw a blue towel out of a window at another point in an apparent attempt to coax him in. Donald Trump didn't mention the incident during a campaign event in Florida Wednesday evening, but tweeted later: "Great job today by the NYPD in protecting the people and saving the climber." Parts of the building, including the terraces, are open to the public during the day.